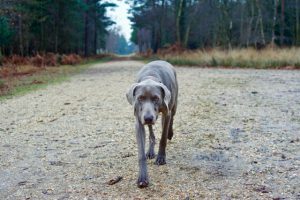 Every good Pub should boast at least one good Pub Walk! 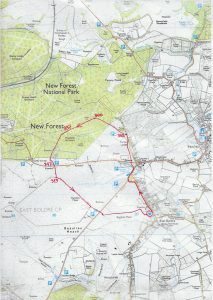 Located as it is right on the open New Forest at East Boldre, the Turfcutters Arms is not only a superb pit stop for cyclists following popular road routes, but also a great base for simply miles of off road walking. 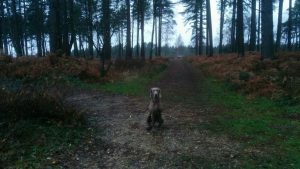 There are bogs and other dangers in the Forest which are sometimes difficult to spot until too late – there are rescue stories in the local news at least once a month! Or at the least they’ll waste your time if you have to double back and find another way. So for your convenience, safety and above all enjoyment, we’ve mapped some good routes for would be walkers, whether to walk off your lunch or work up your appetite! Come on a winter forest walk with me! Walk north as map, past East Boldre Garage and our local shop and post office. East Boldre is a long (nearly 3 miles) linear village with most properties adjacent or at least close to the forest. It was known as a “squatters’ village” as it grew up along the edge of Beaulieu Rails, housing workers involved in the maintenance of the Beaulieu Estate and local industry. 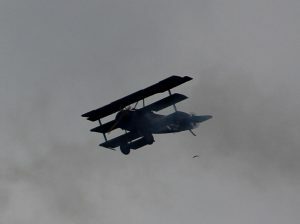 Tourists and visitors are surprised to discover also that it hosts some relatively recent history including the relics of the pre WW1 flying school. We’ll tell you more about that in another article but basically, if you look to the left you’re walking past it. And back in those days you might have seen something like this in the sky above. Hatchet Pond is the largest body of water in the New Forest. It was dug in the 18th Centuary to provide power for the local iron mill. The pond today provides valuable habitats for wildlife including the swans who annually raise their cygnets here. It’s a popular picnic spot loved by families. The west facing view from the car park is so beautiful that it’s also a popular quick pit stop for drivers on their daily travels. Sunsets are spectacular – at all times of year. When you get to the road junction with Hatchet Pond ahead of you, turn right and walk on the gravel track right beside the pond towards the car park, then up the gravel track and across into Furzey Lane which is a dog leg to the right or depending on conditions you can walk on the forest parallel to it. Following the road, Furzey Lane becomes Furzey Lodge when you find houses on both sides of the road and a red letterbox on your right. Most of the houses are owned by practising commoners, who in turn own the ponies on the forest, and one is occupied by an agister, who since the Norman Conquest has had overall responsibility for the welfare of the ponies in the forest. Behind the post is a small fenced pen where the ponies are kept when they are rounded up off the forest during the annual drift. The new foals are then branded and all the ponies have their tails cut according to the mark of their agister. Continue down the track and through the gate into Rans Wood Inclosure. Then up the hill, bear left, follow the track straight ahead, ignore first left turn, but take the second which is a more obvious gravel track (see photo). Down and across the stream, up the other side, along and then bear right keeping to the main track until you get to a left turn which is a slightly narrower track. Turn left where the dog is sitting! This leads you to the edge of the Inclosure at Hawkhill. 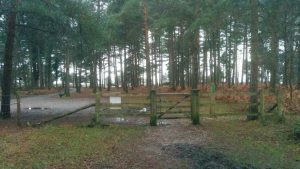 The edge of Hawkhill Inclosure – go through gate! 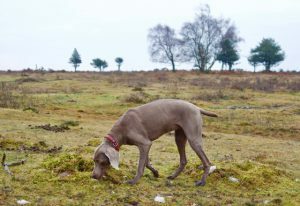 Hatchet Moor is part of Beaulieu Heath which was used as an airfield in World War II but is now used for flying model aeroplanes. Walk out past the car park along the concrete track and across the Brockenhurst road onto another track. Follow this track until the “t-junction” and turn left, this path will bring you past the model aeroplane area to the car park. 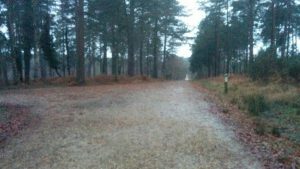 Continue to the main (Lymington-Beaulieu) road, and cross over onto Bagshot Moor which is the stretch of heathland between the main roads to Lymington and the back route via East Boldre. This is the section which can in the worst of winter weather be rather wet – which should be fine if you’ve got your boots on! If you’re not confident of your footwear (or that small members of the party will be able to keep their wellies on their feet!) you can turn left and walk parallel with the road on the wide grass verge, until you’re back to the East Boldre junction, then walk back through the village to the pub. Otherwise just strike out across the moor in front of you, in all but the poorest visibility you’ll be able to see your direction and the path towards the pub is the most well trodden!